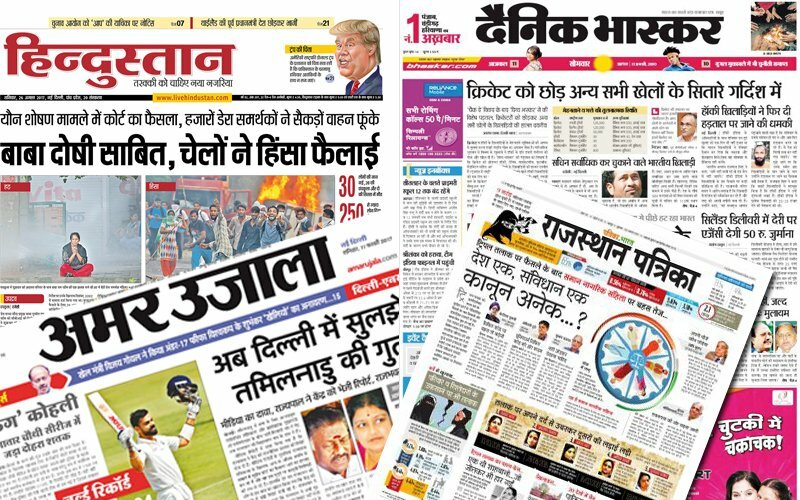 The Hindi dailies represent around one-third of the printed newspaper in the country. Recent examination of the DAVP list of language papers, ABC circulation figures and the IRS 2017 readership survey figures have been decoded by IppStar (www.ippstar.org). These public figures taken together with its own survey data and discussion with expert informants in the language dailies has led to a quantitative understanding together with some thoughts on how the Hindi dailies will progress over the next five years. IppStar has also begun its research of Marathi and Tamil dailies some of which will be shared in subsequent articles. The main proposition that we sought to test was that the leading Hindi dailies will continue to grow in editions, color pagination and circulation. It is likely that circulation revenues will increase with a gradual rise in the cover price but this is seen by publishers as merely a way of keeping up with newsprint price rises, which as a rule of thumb may be anticipated to rise at US$ 60 each year given the global shrinkage in demand. Hindi dailies have cover prices ranging from Rs. 1 to Rs. 5 and the price can vary from day to day, reflecting both pagination changes and a way of increasing prices gradually while moderating customer resistance. Other circulation schemes include sale of annual subscriptions in advance that can be encashed each month in exchange for the daily of one’s choice at discounted rates. We examined approximately 800 Hindi dailies and divided these into five group according to their circulations which we estimate to be about 5 crore copies or 50 million. More than half this circulation comes from the top 20 newspaper groups while another 1.5 crore copies are produced by the next 145 newspapers. The balance copies are produced by the remaining more than 600 much smaller dailies. IppStar forecasts that with moderate growth the circulation of Hindi dailies will increase by .5 core or 5 million copies in the next five years with the maximum growth accruing to the leading 165 Hindi dailies. In the case of high growth over the next five years the forecast is for a circulation growth of 1 crore or 10 million copies daily which will primarily accrue to the leading 165 dailies and of these the top 20 groups are expected to get the major share. IppStar and its expert informants expect that the bottom 600 dailies will decline in circulation by more than 5% and that many of these will close down. The thesis of some of the leading Hindi publishers is that the potential readership now demands local, national, international news and infotainment in one place and in full color, a requirement that can only be met with larger resources and at least 20 full color broad sheet pages, with more pages for supplements and festival season advertising opportunities. This indicates that only the leading Hindi daily newspaper organizations have access to the capital and resources to provide these type of products. In fact, one can expect several scenarios in which the leaders compete to expand in terms of geography, demographics and even omni-channel media.